Nose: Sweet vanilla, tinny lemon, dried figs, dried prunes, sour wood, fruity talcum. Taste: Neutral, bitter wood on the entry makes way for a relatively light-bodied palate with cinnamon and vanilla, and a green wood note that really echoes on the finish in what I find to be a Dickel signature. I like to describe the green wood as wormwood-y, while others have described it as vitamin-like in taste. This singular characteristic shapes the whisky by washing the late palate with a sour, tart, bitter and powdery wood that leaves behind the vitamin-y taste. 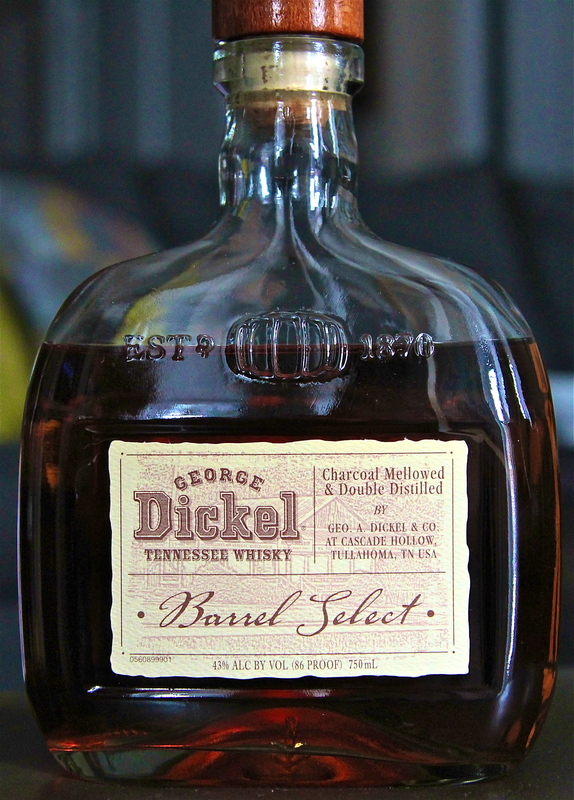 Dickel Barrel Select (DBS) is a much more toned down and elegant whisky than its younger brother, #12. In fact, I find it to be too toned down. At 86 proof, the flavors presented are only after-thoughts. Vanilla, spices, wormwood, sour fruit: these all show up in a diluted form that adds up to more of a tease than a satisfying whiskey. The proof hides a tantalizingly unique flavor profile that is just too neutralized to have a proper voice. George Dickel (GD) is known as “the other Tennessee Whisky,” counterpoint, of course, to the omnipresent Jack Daniels (JD). GD is owned by the British multinational alcoholic beverages company Diageo, and JD is owned by The Brown-Forman Corporation. While the American-owned JD is the best-selling whiskey in the world, GD (which has been around in one form or another since 1877) is barely a blip on most whiskey-drinker’s radar. This is a shame. GD is a singular whisky with a unique flavor profile that might awaken the taste buds of a long-time JD drinker to the joys and curiosities of another whisky made using the same Lincoln County Process of charcoal filtering that JD boasts of. I was a big fan of the DBS the first time I tried it at WhiskyFest Chicago 2011. I had recently spent a fair amount of time with a bottle of the more available Dickel #12, and I thought the DBS showed much of the same characteristics, but in a richer, more refined way. My taste pendulum has swung back in the other direction, however, as I find that this bottle of DBS (hand-selected from a batch of 10 barrels in 2006, as indicated on the label) fails to elevate the classic Dickel profile in the way I first experienced. Dickel #12 may be a little hard to bear, but its bold taste is to be admired and acquired. DBS apologizes for the brash nature of D#12 and offers a sweeter, more diluted alternative at an elevated price. ~ by WhiskeyWonka on June 25, 2012.